Looking for unique design ideas and new information on privacy window products from Hy-Lite, a U.S. Block and Windows Company? Check out the company's brand-new Web site, new Facebook fan page, updated twitter feed and a hot-off-the-presses, full-color product catalog. "Comprehensive product information about Hy-Lite's robust privacy window lines should be easily and readily accessible to those looking for new and interesting design concepts," says Tom Rachfal, vice president of sales & marketing for Hy-Lite. "More and more, people are turning to online sources and social media for their product information. Our goal is to ensure that all the desired tools are out there - product specifications, inspirational color photography, and information-packed literature - to meet the needs of builders, remodelers and consumers nationwide." Clean, modern, and visually appealing, the completely redesigned Hy-Lite Web site (www.hy-lite.com) features full access to Hy-Lite's robust privacy products, including acrylic bock windows, glass block windows and decorative glass. The newly-launched site seamlessly fuses the previously-independent lines of Hy-Lite Products and U S Block Windows, Inc. after a recent acquisition, creating the single-largest source for privacy window products in the industry. Additional elements of the site include an upgraded, more streamlined online store, detailed performance test data, freshly-designed literature downloads and a modernized media center. Social media portals for Hy-Lite have been expanded and rejuvenated in order to reach key audiences who, more and more, turn to social media for unique and stylish design ideas. A new Facebook fan page ("Hy-Lite, a U.S. Block Windows Company") showcases product and application photography, as well as providing a forum for information sharing. Industry trends, company news and more will be shared on a timely basis with fans of the page. On Twitter, keep an eye out for regular industry tidbits and innovative design ideas at @HyLite_Windows. Making its debut at IBS 2012 is a brand-new, comprehensive catalog of featuring the full line of designer privacy window products from Hy-Lite. The 52-page color catalog includes beautiful color photographs designed to inspire, as well as complete product specifications. The catalog will be available in the Hy-Lite booth (#W2721) at IBS and online at www.hy-lite.com. Headquartered in Pensacola, Fla., Hy-Lite®, a U.S. Block Windows Company, offers the widest selection of prefabricated privacy products in the industry. 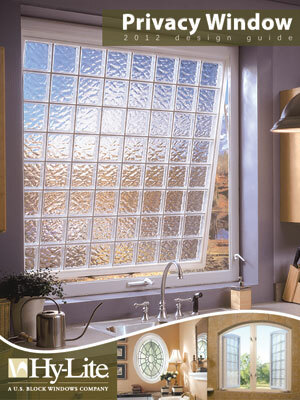 Product lines include a variety of operable and fixed acrylic block and decorative glass windows. Additional product offerings include glass block windows along with an assortment of acrylic block shutters, accent panels, radius walls, partition walls, door inserts and shower kits. For more information, please visit us online at www.hy-lite.com; on Facebook at "Hy-Lite"; on Twitter at @HyLite_Windows; or call 888-256-2599.